Bulgaria received 36 L-39ZA Albatros trainer- and light attack aircraft between 1986 and 1990. They are used by the 12 UAB at Kamenec. 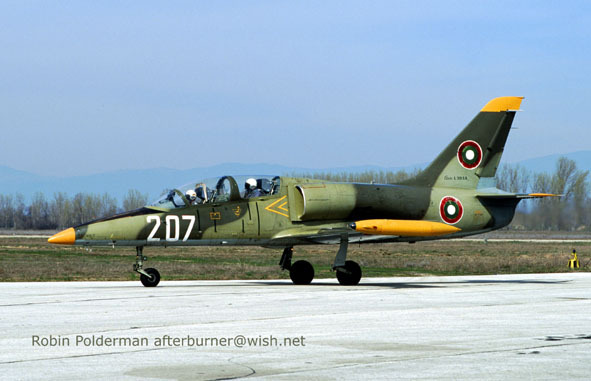 One L-39 and its crew, Major Asen Hristov and Cadet Joro Dentsjev, were lost on October 2, 1990 on approach to Kamenec. A number of L-39s were detached to fighterbases starting in 1995. Dobritch, Ravnets, Chesnegirovo, Bezmer and Graf Ignatievo operated the type alongside their fighters. A number were sold in 2001, with at least one going to the United States. Another example is preserved at Kamenec. The Bulgarian AF L-39s are: 101, 103, 105, 107, 109, 111 (734101 etc), 137, 139, 141, 143, 145, 147 (035137 etc), 201-203, 205-207, 209-211, 213-215 (035201 etc), 827, 829, 831, 833, 835, 837 (633827 etc), 907, 909, 911, 913, 915, 917 (633907 etc).